Some people develop sensitivities to one or multiple substances in wheat, and experience some degree of health problems whenever they ingest them. Allergic reactions to proteins and other compounds in wheat flour create mild to life-threatening allergy symptoms. In a small percentage of cases, taking aspirin or exercising elevates symptoms of flour allergy to a systemic, or total-body, level. An allergy to wheat, which contains gluten, is not necessarily the same as gluten intolerance. Only an allergist can test for and make this determination. Itching can arise from allergic reactions through direct skin contact with flour or through ingesting foods that contain flour. Handling whole-wheat or white flour, as when kneading dough, can cause eczema-like allergy symptoms, according to the Mayo Clinic. These symptoms include redness and itching on the hands or other contact areas that may be accompanied by a raised, bumpy rash called hives. Internal itching develops in some after ingesting flour. Patients may experience itchy lips, mouth, throat, tongue and eyes shortly after eating foods that contain wheat. During an allergic reaction, histamines enter the bloodstream and elicit an inflammatory response. In addition to itching, the membranes of the nose and mouth may swell, partially obstructing the airways. As the University of Maryland Medical Center reports, histamines also cause fluids to accumulate in the nasal and sinus passages. Allergy symptoms of stuffy or runny noses may seem like those of a cold or flu, but may actually be attributed to flour allergies. When difficulty swallowing or breathing occurs shortly after eating wheat foods, this link is likely. 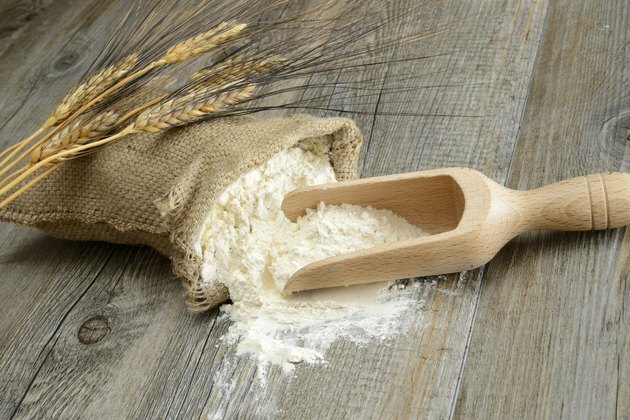 Flour allergies will create problems in the digestive tract an hour or more after patients eat items that include wheat. The National Institutes of Health explain that this timeline relates to how allergens spread through the body. Timing may be affected by how much patients eat and what else they have eaten. A sensation of nausea may occur first, followed by vomiting or stomach pain. As the body digests the food, patients may experience intestinal cramps and diarrhea. Anaphylaxis, the most severe allergic reaction, can occur from common flour allergies or from aspirin- or exercise-induced complications. It usually comes on more swiftly than gastrointestinal allergy symptoms, sometimes moments after eating foods that contain wheat. Patients should call 9-1-1 for help if they suspect anaphylaxis. The National Institutes of Health describe the signs as a quick drop in blood pressure that may cause weakness and confusion. Any breathing symptoms will escalate, reducing the amount of oxygen that reaches the heart and brain. An abnormal pulse and wheezing may precede fainting and, in extreme instances, death.